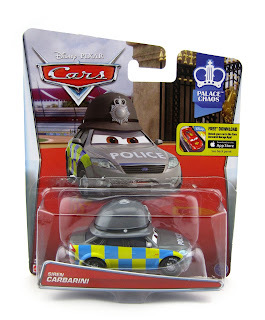 Here we have yet another new Mattel Cars 2 diecast character...Siren Carbarini! He is part of this year's 2015 "Palace Chaos" sub-line (#4/7) and is Mattel's signature 1:55 scale. In the film, Siren is one of the London police officers (or "bobbies" since we're talking about England here) seen protecting the Queen from Miles Axlerod's "bomb." However, since there are many of these officers that look completely identical during the film's London scenes, it's hard to know exactly which one is actually Scott. The screenshot above is my best bet. 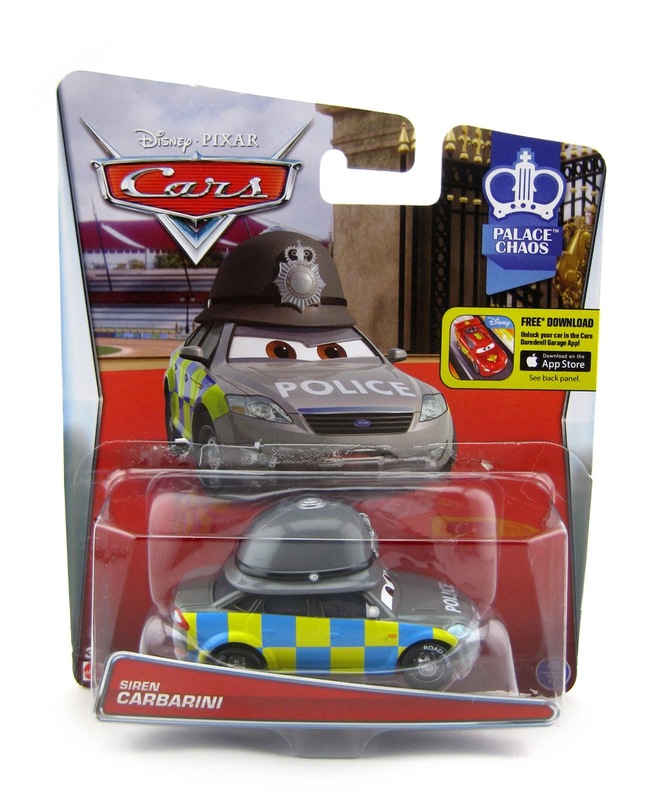 Siren here almost 100% identical to another London police car released in 2013 (Mark Wheelsen, see post HERE). The only slight differences are his license plate number and facial expression. Note: for a great comparison of the two, head over to Take5aDay HERE to check out their post on the subtle differences (featuring loose pics). Even though I do have one just like this, it was different enough that I couldn't help but snag it (being the "completist" I am). If anything, it will work great for scene/diorama building! You can find Siren in stores now (I just found him at my local Target yesterday actually). If you'd rather snag him online, be sure to check out current eBay listings HERE or visit Amazon using the direct link below. Happy hunting!